Bubble boys provides the most unique experience of playing football in bubbles at the cheapest price in the uk with exclusive packages that include venues. We are the cheapest provider of the new craze that's hit the UK and best of all WE COME TO YOU! On Monday 22nd April 2019 the sun will rise at 05:52 and will set at 20:09. It's going to be quite a warm day, with temperatures reaching 24.2°C. Today is expected to be a dry day, with a very low chance of rain. It will be quite a breezy day, with a maximum expected wind speed of 11mph. On Tuesday 23rd April 2019 the sun will rise at 05:50 and will set at 20:11. It will be a mild day, with temperatures reaching around 22.2°C. Today is expected to be a dry day, with a very low chance of rain. It will be quite a breezy day, with a maximum expected wind speed of 13mph. On Wednesday 24th April 2019 the sun will rise at 05:48 and will set at 20:13. It will be a mild day, with temperatures reaching around 16.7°C. Today is expected to be a dry day, with a very low chance of rain. It will be quite a breezy day, with a maximum expected wind speed of 19mph. On Thursday 25th April 2019 the sun will rise at 05:46 and will set at 20:14. It will be a mild day, with temperatures reaching around 14.8°C. Some moderate to heavy rain is expected, 7mm of rainfall is possible today. It could be quite a gusty day today, with a maximum expected wind speed of 24mph. On Friday 26th April 2019 the sun will rise at 05:44 and will set at 20:16. It will be a mild day, with temperatures reaching around 14.5°C. A light shower is possible, 2mm of rainfall is possible today. It will be quite a breezy day, with a maximum expected wind speed of 18mph. On Saturday 27th April 2019 the sun will rise at 05:42 and will set at 20:18. It will be a mild day, with temperatures reaching around 12.9°C. A light shower is possible, 2mm of rainfall is possible today. Some quite strong winds are possible today, with a maximum expected wind speed of 37mph. On Sunday 28th April 2019 the sun will rise at 05:40 and will set at 20:19. It will be a mild day, with temperatures reaching around 15.5°C. A light shower is possible, 1mm of rainfall is possible today. It will be quite a breezy day, with a maximum expected wind speed of 14mph. On Monday 29th April 2019 the sun will rise at 05:38 and will set at 20:21. It will be a mild day, with temperatures reaching around 10.9°C. Today is expected to be a dry day, with a very low chance of rain. There will be a gentle breeze in the air today, with a maximum expected wind speed of 12mph. 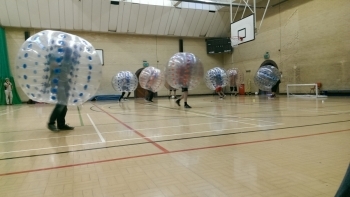 Bubble boys provides the most unique experience of playing football in bubbles at the cheapest price in the uk with exclusive packages that include venues. We are the cheapest provider of the new craze that's hit the UK and best of all WE COME TO YOU!